Every time I make this fteer, I am transported back to my grandmother’s kitchen. I close my eyes and allow the smell of the anise and the baking bread to wash over me and I am a kid again, 7 years old running in from the orange orchard excited about seeing a bird’s nest or a rabbit!I find my grandmother in the kitchen humming a song, working her magic transforming simple fresh ingredients into her signature ring date cookies or sesame crackers or this wonderful flat bread. You see my grandmothers was one of those old ladies who expressed their love and affection by cooking and baking. Most of her children including my dad lived abroad so whenever they came home to visit, she would love nothing more than to make them their favorite meals and baked goods. 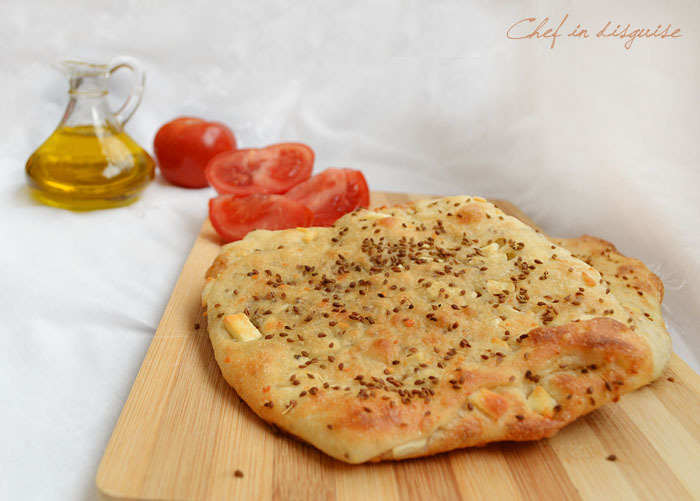 This fteer or flat bread which is also known as Palestinian peasant bread can be made with a variety of fillings. My grandmother made three varieties of this layered bread, cheese and anise, oregano and green onions, and a sweet almond one that she would drizzle with syrup. You can also make it with spinach instead of the oregano if you like. There are 2 keys to making amazing fteer. The first is to brush the dough with olive oil after each fold. That gives the final product wonderful thin flaky layers. The other key is use of fresh ingredients, as you will see in the ingredient list, the dough is simple, flour, yeast and water. It is the fresh filling ingredients that transform this from a regular simple bread to a wonderful layered bread that is bursting with flavor with every bite. The filling can be adapted to your liking. Spinach and onions, oregano and green onions, or almonds are the traditional choices but you can try new and different combinations,use your imagination. As you can see in one of my pictures, I like to cut the bread into sticks and serve it as an appetizer, this is actually my kids’ favorite way. Posted in Arabic and middle eastern recipes, Bread and pastry and tagged anise, breakfast, cheese sticks, cup olive oil, cup vegetable oil, flat bread, food, how to fold pastry, middle eastern recipes, Nabulsi cheese, Palestine, Palestinian, recipe, step by step, tablespoon yeast, فطير فلاحي فلسطيني, فطير بالزعتر, وصفه, خبز فلاحي فلسطيني, زعتر فلسطيني, زعتر اخضر. Bookmark the permalink. This looks delicious! Great recipe and very organized; easy to follow! This is one of my favourite foods EVER!! My god! I would have this now!!! What marveles you present us! this fteer is so magnificant, I can smell it baking and hear the children playing while they wait for it to be done! I’d like to eat some of this right now! Ha! I can actually make this now. I bought some anise seed last time I went to Sweden (never seen it in France before) – I love it in Bread… I made some hard bread with it in a few months ago which was great… will need to try flat breads too – thanks for sharing this, it looks yummy. I love anything that combines tomatoes, olive oil, basil (and mozzarella) so this recipe is right up my alley. I’m going to give it a go this weekend, accompanied by some wine, of course. Great blog over here! This looks wonderful, Sawsan. I’m wondering if I can make a sourdough variation (I have sourdough starter that must be used every week or so): since the sourdough is essentially flour, water and wild yeast I may give it a go. I don’t see why a sourdough variation won’t work, as you said, it is flour, water and yeast But I have never tried it myself. This is similar to the Chinese scallion pancakes except we do not add yeast and it is cooked on the stovetop in a frying pan instead of the oven. I have never heard of scallion pancakes, will have to look them up. This bread is sooo beautiful.. and as lovely a tribute to your grandmother. I really enjoyed reading about you as a young girl in your grandmother’s kitchen. What a wonderful woman! This is just wonderful looking. It’s on my must make list! Oh I can just imagine how good this smells! The fteer looks beautiful. 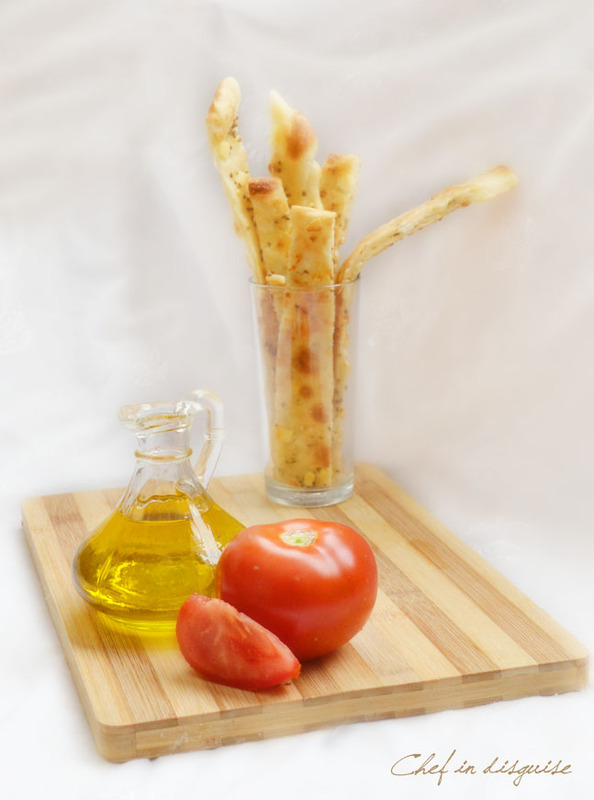 Love the memories- and of course, the beautiful golden flat bread! That flatbread looks amazing. 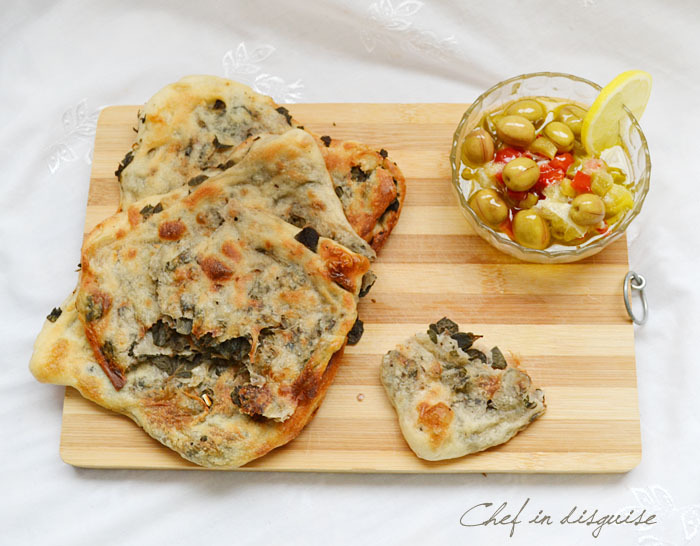 I m too fond of flatbreads & any new recipe is always welcome, Thanks for the step by step! Oh wow – this is a beautiful recipe! I love the memories that go with your recipes too and can imaging you running around outside as a child. We are growing spinach this year and are just starting to pick the first leaves, so I would love to give the spinach version a go. Will let you know how it works out! PS: Love the look of the blog! Thank you so much Tanya. My grandparents have passed away years ago and that is why I really hold my memories with them dear. Sounds great – I should have enough spniach to pick again in a day or two, so will be making this for sure! I am definately going to try it 🙂 can we use some other flour..like whole wheat flour? or perhaps a mix of AP and whole wheat? The yeast is dry yeast. What a wonderful picture you paint! This bread looks delicious! You have beautiful memories of your dear grandmother. This bread makes me smile. I can’t wati to try it. It is possible to be a breadaholic? A 12-step program? I think I’m needful. I love bread of any sort. Your grandma sounds just like mine – she can be counted on to bake up a storm of your favorites when you go and visit. Love it! And this bread looks so good, Sawsan! Glad you liked it Courtney. Oh no, I’m in LOVE with another one of your beautiful recipes, Sawsan, particularly because of the story you have woven into it, but not-with-standing the incredible flavours within the recipe. I was going to make Chgo John’s (from the Bartolini Kitchens) cheese bread to take to Barb’s (Profiteroles and Ponytails) next week, but this one is SHOUTING my name. I have spinach and feta at home now…I’m not sure I can wait to make this next week! JT will be happy about it! You are too kind sweet Eva. Hi Sawsan, I actually froze half of it and will defrost it for the weekend so I will definitely brush more oil onto it as I fold it. Thanks so much for the tip. This looks amazing- I love the layers and how it comes out flaky. I will have to try this soon! Sawsan, this bread looks amazing! This is my kind of recipe–and your instructions, as always, are easy to follow. At first i thought you sprinkled carom seeds on it, looks so alike! Would love that bread with some hot soup. I’m so happy the recipe turned out perfect for you. Thank you so much for trying one of my recipes and for taking the time to let me know. What a beautiful bread! 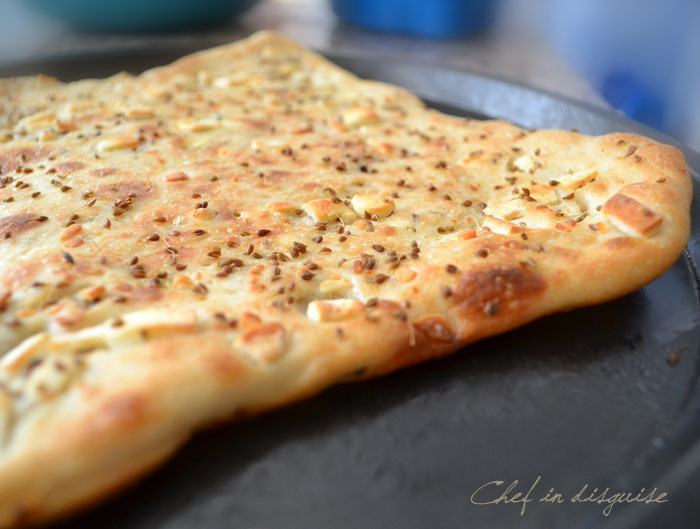 I love the hint you gave of brush it with oil after each fold and then the use of the anise – YUM! Bookmarked! Thank you so much MJ. 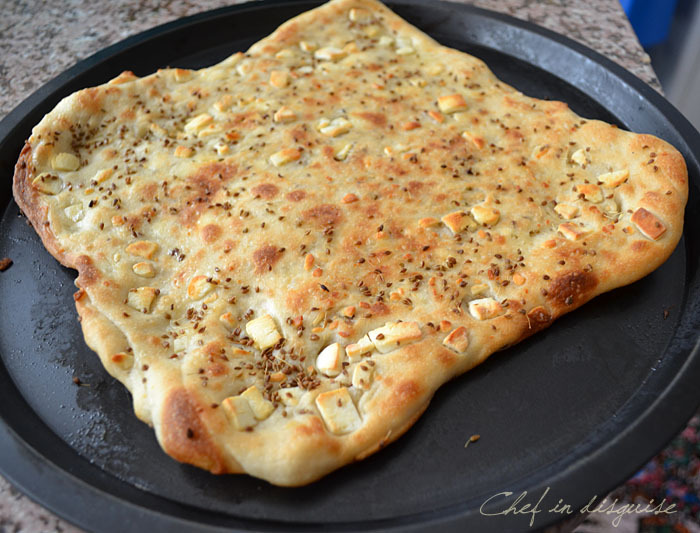 This flat bread looks beautiful Sawsan and I am envious of your childhood. You have such a great memory of your grandma in the kitchen, and you definitely have great cooking gene from your grandma! I am a big fan of bread – all kinds, and this looks so delicious I know it will be addicting! You’re making my mouth water! I might have to give this a try at home — we have a nice thick slice of goat feta I think would be delicious — it’s an icy cold day here in Boston — this hot bread and some soup is just what we need!! assalam o alaikum sawsan, really like your website. can you tell me what is anise? and what can i use as a replacement? turned out great! (not so humble of me ) but really wonderful! now i just need to convince him to get me more zaatar so i can try the other recipes . i am so happy my friend told me about yur recipes. I used to eat this bread filled with cheese and honey when I was livingin Middle East and now back home in South America I couldn´t find any recipe. I will try it for sure! Thankyou so much for sharing your beautiful stories, I feel transported to a land I love. You made my day, thank you! Violet.